Vicente produced a storming finish to win the Scottish Grand National at odds of 14-1 as champion trainer Paul Nicholls enjoyed four winners at Ayr. There were high hopes of a Scottish victory when Seeyouatmidnight surged to the front with one fence to jump. 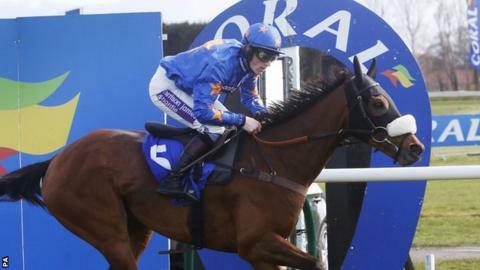 However, Vicente, ridden by Sam Twiston-Davies, powered home in style to seal the £120,000 first prize. Alvarado passed Seeyouatmidnight right on the line for second, with Royale Knight coming in fourth. A good day at Ayr gives Nicholls a lead of just over £30,000 from Willie Mullins in the prize-money-determined trainers' championship for the jumps season, which ends next Saturday. Mullins' hopes of winning the big race for Ireland came to a premature end as 8-1 joint favourite Measureofmydreams crashed out in the early stages. Then Folsom Blue, trained by Mouse Morris, who had won both the English and Irish Nationals, exited six out to end dreams of a historic hat-trick. "It was a brilliant result," Nicholls told BBC Scotland. "You try all season to win these big races and a few of them have eluded us but that was a special moment. "That was one of Sam's best ever rides, I'd say. He's learning all the time and he's a fantastic guy. "This has been the target for Vicente all season. I thought Cheltenham would do him good and you don't win these races without a prep run." "I suppose Paul Nicholls has not been champion trainer for nine of the past 10 jumps seasons by waving the white flag when the going gets tough. "And despite predictions that the title was well and truly slipping away when he lost the lead in the prize-money-determined championship to Willie Mullins at Aintree, Nicholls himself determined to retaliate, and an Ayr four-timer highlighted by Vicente was the perfect way to do so. "A week to go, and with big money at Perth and Sandown to come, this race is going to the wire."